For the past few years now, I've been a big fan of granola for breakfast. I prefer something sweet over savory for my first meal of the day and I like to eat a lot of fruit in the mornings, so granola is perfect. 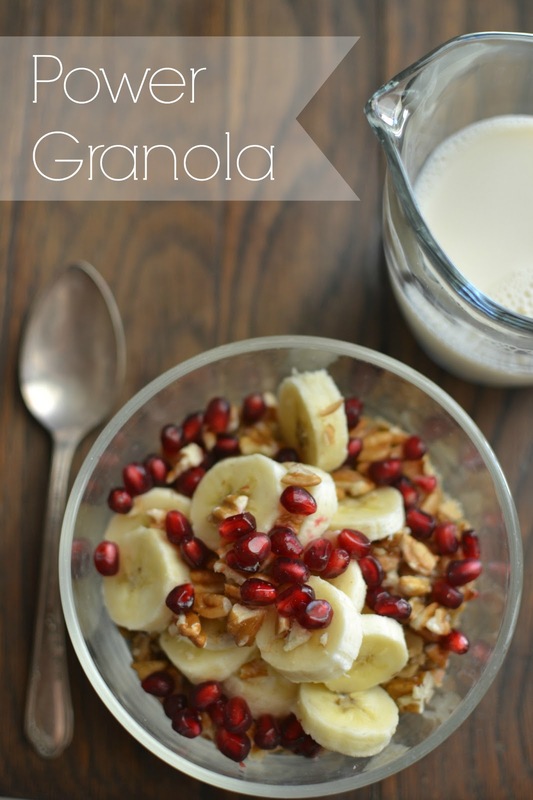 Here's my go-to recipe lately that I like to call my "power granola." I've found that this is my favorite combination of add-ins to my granola, and it keeps me full and satisfied until lunchtime. I look forward to eating breakfast each morning when I know it's going to be this good! If you've never made granola at home, I'd highly recommend giving it a go! I just started making my own granola last winter and haven't stopped since. I've gotten into a routine of baking it each Sunday night so I have plenty to last through the week. I keep it in a pretty glass jar on my counter so it's ready to go. Do you like granola? What are your favorite add-ins? I have oatmeal or granola almost everyday:) this looks so good Tammy and I can't wait to try your recipe! Looks and sounds quite delicious. Definitely healthier than what I eat lol. That looks simply yummy! I must try! I like to mix my granola with yogurt. I love almond or coconut milk, along wit chia seeds. Your recipe certainly looks tasty! That looks delicious!! I eat Kashi every morning...I should add some more to it too! I add almonds and bananas or peaches...we have a ton of peaches right now from our tree. Have a great day!! This sounds delicious. I usually mix my granola into yogurt, but I think I'm going to give this a shot in the very near future! This really sounds great! And looks fantastic! I've made my own granola many times. Its so easy and tasty! I like granola and would love to make my own. I am allergic to a lot of seeds so I would have to leave them out. Do you have any other recipes to share? Tammy, your granola looks delicious. I would love it with the strawberries and bananas. Great receipt, thanks for sharing! I will have to try your recipe. It does look good! This looks and sounds absolutely delicious! I'll try it this week. Looks like it might be a new favorite for me too :) Thanks for sharing! That sounds and looks wonderful! I bet some honey drizzled on top would be good too! That's looking pretty tasty! I like a little yogurt w/granola on top sometimes. Your picture made me think of cranberries, I may try to add some next time we do granola. Looks delicious! I've never had hemp or chia seeds. I'm going to have to start making granola again!! I would love to have that for breakfast tomorrow! Yummy! Looks like a very healthy breakfast too. I love pomegranate seeds. It's hard for me to eat much granola due to my tmj and it being so hard and crunchy but every now and then I would love to make a batch. I got a yogurt maker for Christmas last year. In addition to homemade yogurt we have also been making granola. You're right nothing better than homemade. Delicious - but I'll have mine without the pomegranate thanks! Yummmmmmmmmmm. I love coconut,almonds and nutmeg in mine. Pomegranate makes such a nice alternative. That looks very Delicious that is a must try Recipe. oh gosh ,that looks really, really good! Yummy! I love this! I also do oatmeal, a little cinnamon, a small amount of Truvia (sugar), yogurt, and fresh (or frozen if a must) fruit as a breakfast. I love granola for breakfast. I also like it with yogurt and even with ice cream. I make my own granola with oatmeal and lots of other stuff and bake it in the oven. I love the way it smells when it's cooking. I have a few different recipes. That looks so good and I am STARVING!!!! Such a neat idea and so healthy for you!! I JUST today read about the chia seeds and how wonderfully healthy for you, topping the charts in iron compared to flax, hemp, or sunflower seeds. Also fiber and calcium! I'll have to try this!! Yum! i love granola and I love making it myself. the pomegranate seeds are a nice touch. great photos. makes you hungry! Looks so good! Great way to start a day! Hi Tammy Hmm I thought I had left a comment here ...don't see it I must have written down the recipe snd forgotten to leave a comment . IT was delicious by the way ... I will have it more often! My gosh that looks fantastic and so full of healthy goodness.